Time to Take a Closer Look at Hedge Funds? The global hedge fund industry last year produced its best returns since 2013, driven by strong performances from managers who bet on stocks. 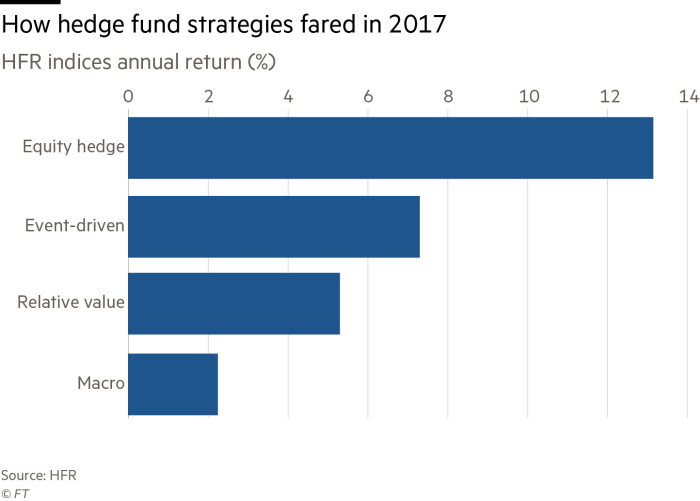 Figures tallied by HFR, the research group, this week show that hedge funds across all strategies produced returns of 8.5 per cent in 2017, better than the 5.4 per cent recorded in 2016. Equities hedge funds — which include long-short funds, growth and value funds and sector-specific strategies — were up 13.2 per cent, their best showing in four years. Advisers say it is too early to be sure this return to form will assuage investors’ concerns about high fees and mediocre long-term profits. But a cautious optimism has returned to the industry after the outflows of 2016 — the worst year for flows since the financial crisis — and many managers posted robust, or even eye-poppingly good, returns. Long-short equity funds, which can make both positive and negative bets on stock price movements, were some of the best performers of the year, helping to retain money that investors had been rapidly shifting towards cheaper, passive and more liquid products. Some of the biggest long-short equity shops had funds that returned double-digits last year. Some smaller managers did particularly well: Whale Rock Capital and Light Street Capital returned 36.2 and 38.6 per cent, respectively, off the rise of technology stocks including Alibaba. Tiger Global, one of the largest long-short managers, had returned 27.5 per cent as of the end of November. Activist funds performed strongly, too. TCI, the London-based activist, was up 28.2 per cent for the year. Marshall Wace, Lansdowne, Cevian Capital, Teleios Capital, Brenner West and Naya Capital all had funds with returns in double digits for 2017 as a whole. The revival in fortunes came just in time. Bob Leonard, a managing director at Credit Suisse’s investment bank and its global head of capital services, said equity long-short had been “on a lot of people’s watch lists” for possible redemptions. But, while investors who are currently invested in equity long-short funds that outperformed are likely to stay, they are still unlikely to add to the allocation, he said. All equity funds were buoyed by rising stock valuations, as the S&P 500 rose 19 per cent last year. “Some are thinking that equity valuations are getting a bit stretched, and no one knows when or how this ends, but some institutional investors are taking chips off the table,” Mr Leonard said. Macro funds managed returns of just 2.3 per cent in 2017, according to HFR, but that was better than the 1.0 per cent of the previous year. Relative value funds, which trade mainly in the credit markets, returned 5.3 per cent, less than the 7.7 per cent in 2016. Despite the industry’s overall higher returns of the past year, investors are still wary of hedge funds. The high fee structure — traditionally a 2 per cent fund management fee and a 20 per cent performance fee — came under fire. Funds responded by reducing fees, and the money that still flowed into the sector was consolidated mostly at the largest funds. Hedge fund closures outpaced the number of funds that opened in 2017 for the third year in a row, claiming several veterans of the industry. John Griffin’s Blue Ridge Capital, Neil Chriss’s Hutchin Hill Capital and Eric Mindich’s Eton Park Capital all shuttered, while Paul Tudor Jones closed one of his funds. Don Steinbrugge, chief executive of investment consultant Agecroft Partners, predicted that while the amount of money managed by the industry would continue to grow in 2018, the number of hedge funds closing down would also rise. Just in time for Stevie Cohen’s hyped-up reinvention, hedge funds are back. Sort of. On Monday, trade title HFR, published returns for 2017. Profits last year were the best since 2013, led by groups that bet long and short on stocks. Still, the gains trail the cheap, passive strategies that have proliferated of late. 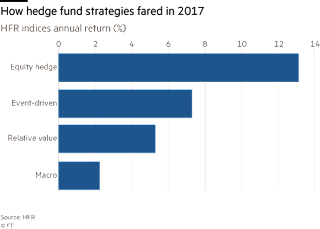 Some big pension schemes have quit hedge funds, turned off by the costs and weak performance. Hedge funds are useful when they embody their name: as hedges against tricky, volatile markets in a diversified portfolio. But until markets are experiencing real turbulence and pricey, active management proves to be a buffer, it is premature to proclaim a hedge fund renaissance. The overall HFR hedge fund index returned 8.5 per cent in 2017, its best in four years. The S&P 500 was up a fifth. After years of trailing key benchmarks, masters of the universe such as Eric Mindich and Paul Tudor Jones, on one portfolio at least, have thrown in the towel. In 2016, the latest data available, hedge fund closures topped 1,000, a figure not seen since the financial crisis. Pension funds such as Calpers and NYCERS (New York City public employees) have pulled the plug on hedge fund allocations in recent years. Not all customers are jaded. The famed Yale University endowment now allocates more than a fifth of its money to hedge funds. 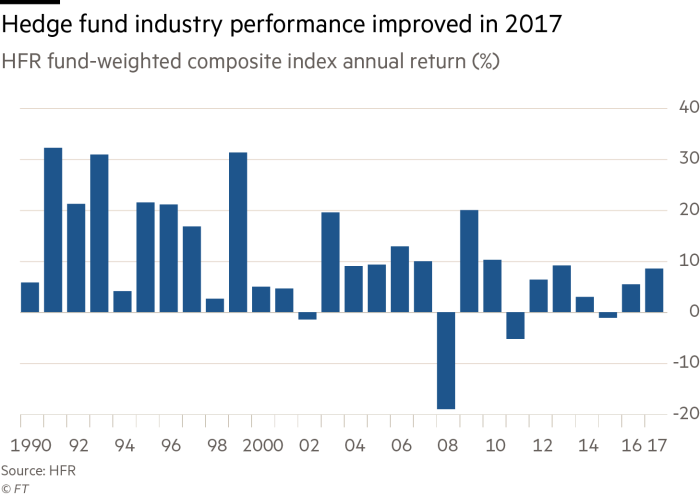 Over the past 20 years, hedge funds have returned nearly 10 per cent annually for Yale, with little correlation to the broader market. Yale has pushed back against criticism of high fees, arguing that these are justified by performance. Unlike many institutions, it has had the skill (or luck) to pick top funds in advance. Since Yale is not offended by big fees, it can consider the revival fund Mr Cohen is now launching. Rather than a shopworn “two and 20” structure, Mr Cohen plans to reprise his old management fee of 2.9 per cent, taking up to 30 per cent of investment gains. The greatest feats of hedge fund managers are in marketing, rather than investment. A brief comment on hedge funds as I had a discussion with a friend of mine earlier on asset allocation and whether it's worth investing in hedge funds given how well stock markets have performed since 2009. 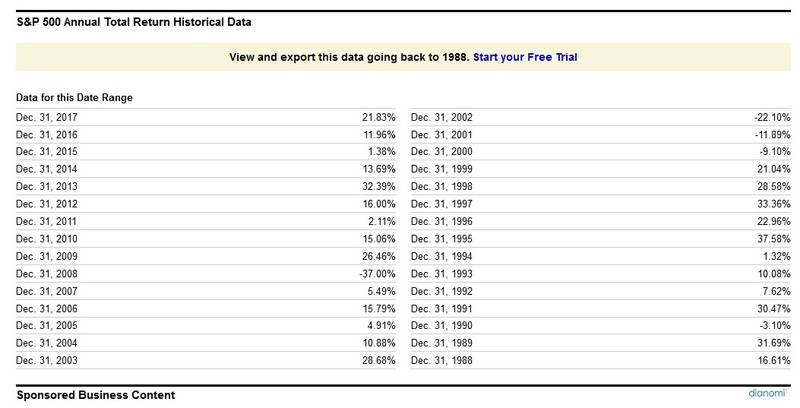 You will notice the two worst years going back to 1988 were 2008 (-37%) and between 2000 and 2002 (-9%, -12%, and -22%). No surprise as these periods followed the subprime mortgage bubble and the tech bubble. The second thing you will notice is since 2009, the S&P 500 (SPY) has been up a lot and the returns for Nasdaq stocks (QQQ) have been even better. In fact, since bottoming in March 2009, the S&P has more than tripled and the Nasdaq-100 is up more than fivefold. 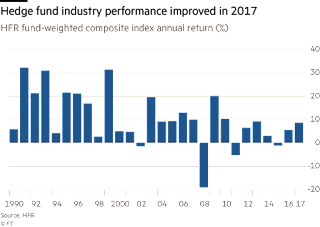 Given these impressive index returns, it's hardly surprising that investors aren't too concerned about hedge funds or have shunned them altogether. Why bother trying to find a good hedge fund when many top managers are struggling to deliver alpha and when you can just buy the S&P500 or Nasdaq-100 and forego all those hefty fees to external managers? But wait a minute, the good times won't last forever, and if we get a string of bad years, surely then hedge funds will prove to be very useful for large institutions looking for uncorrelated returns, right? Maybe but that remains to be seen. Most hedge funds have a lot of beta embedded in them so if markets get clobbered, I guarantee you the majority of L/S Equity and even activist funds are going to get clobbered too. Perhaps not as much as the index (after all, they hedge a portion of their assets) but they will experience serious drawdowns (as they charge hefty fees). So what? As long as they're outperforming markets on a relative and risk-adjusted basis, who cares if hedge funds run into trouble? I agree but a big asset allocator doesn't care because he or she knows once markets come back, hedge funds will once again be left in the dust. Also, why pay fees to external absolute return managers who might be performing well relative to their peers but are still severely underperforming the S&P 500 over a long period? "Yeah but Leo, you're a smart guy, the future won't look like the past, you just wrote a comment questioning the great market melt-up of 2018, stating central banks have juiced these markets and you know things will eventually calm down and when the storm hits, it will be with us for a very long time." I know all this and my gut is telling me even though macro gods were in big trouble last year, maybe this year they'll finally come back strong. But there is something else that I'm fully aware of. A lot of the big pensions and other large institutions that read this blog don't really care about hedge funds. Why? Because they prefer long-dated private markets like private equity, real estate and infrastructure where they can put a lot of money to work and generate the long-term returns they are seeking to meet their long-term actuarial target rate-of-return. Still, some of the more sophisticated shops like Ontario Teachers' and CPPIB have a sizable allocation to external hedge funds and just like Yale, they want to find uncorrelated returns, a high Sharpe ratio in alternative strategies that are fairly liquid (especially compared to private markets). Other less sophisticated pensions have turned their back on hedge funds and that has proven to be a wise decision since 2009. I'm less sure about latecomers to this trend like North Carolina’s treasurer Dave Folwell. All this to say when it comes to hedge funds, I'm very careful weighing the pros and the cons. You will hear all sorts of good and bad arguments for and against them but given where we are in the cycle (see my Outlook 2018), I would be actively looking to build long-term relationships with top hedge funds, big and small. 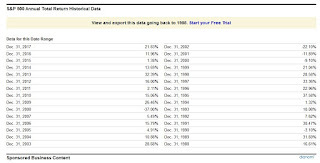 The S&P 500 was up 22% last year which explains why so many funds closed shop. 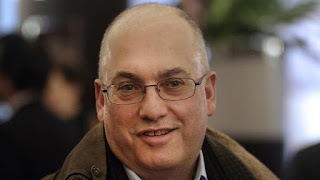 Paying 3 & 30 to any hedge fund manager sounds nuts but Stevie Cohen isn’t just anyone, he’s one of the best traders in the world. If anyone can deliver alpha in a brutal environment, it’s him. If he’s not performing well, I guarantee you others are performing miserably. Would I invest in Cohen's new fund and pay 3 & 30? You bet but I wouldn’t give him rock star treatment and I'd demand we meet face to face at least once if not twice a year (nothing personal, I wouldn't give any external manager rock star treatment, it's not my style and nor is it your job when allocating to external absolute return managers). What about other hedge funds? I like many of them, some well known, some less well known but you're not paying me enough to share this information with you. Do your own due diligence and discover some gems out there who are crushing it, keeping in mind the macro context we're headed in right now. For example, in L/S Equity, I don't want sector neutral guys and gals, I want top stock pickers or amazing traders like Cohen. In global macro, I want to see alpha generation across stocks, bonds, and currencies. As far as hedge fund quants taking over the world, some of them are going to get clobbered while others will weather the storm. Whatever you do, if you're going to invest in hedge funds, make sure you have a solid team that knows how to sit down with these fund managers and conduct a proper operational, investment and risk management due diligence. If you need help from an external consultant, get it, but it's always wise to hire talented people who know to talk the language of hedge funds. That's all for me. Please don't email me telling me how great hedge funds are on a risk-adjusted basis or how awful they are and only a fool would invest in them instead of the S&P 500 ETF (Buffett and Munger's argument). I'm getting old, have been around the block a few times and have no patience for stupidity from people who only see black and white when it comes to hedge funds. Below, it's been a wild day in the markets where the Dow briefly broke above 26,000 for the first time and was up 283 points at session highs before reversing course ending the day down 10 points. Rich Ross, Evercore ISI, and Michael Bapis, Bapis Group at HighTower Advisors, discuss the big moves in the markets today with CNBC's Brian Sullivan. And CNBC's Leslie Picker reports on what to expect from hedge funds this year. I'm not sure I'd expect much, some will perform well but most will get clobbered. Pick your hedge funds carefully. CPPIB's Big Investment in Chinese Properties? The Danger of Irrational Complacency? Ray Dalio on the Dollar, Stocks and Bonds? Canada's Pensions Bet on Industrial Innovation? APG Pushing the Limits on Factor Investing? The 2018 Treasury Bond Bear Market? Why the 2018 Consensus is Wrong? CPPIB Investing in UK's Housing Shortage? The Great Market Melt-Up of 2018? Outlook 2018: Return to Stability?